We had to wake up uncharacteristically early to make sure we caught the train to Shanghai. 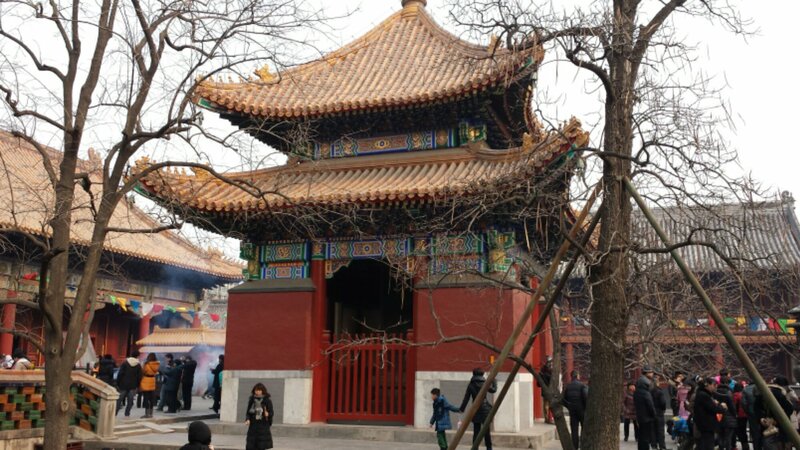 Having packed up the night before, there wasn’t much left to pack, however, as spring festival winds down, Beijing is winding back up, so we had to leave early as traffic is a whole new experience here, nothing like what you would encounter in the western world. Luckily, traffic wasn’t so bad. We got to the train station with plenty of time to spare, got our tickets and had a nice fast Chinese food breakfast. One of the items we had were steamed dumplings full of meat and broth. These dumplings are a little delicate since they are filled with liquid, but they are absolutely exquisite and they are a specialty in Shanghai! On the train to Shanghai! We boarded the train to Shanghai on time, but it was slightly delayed due to weather. 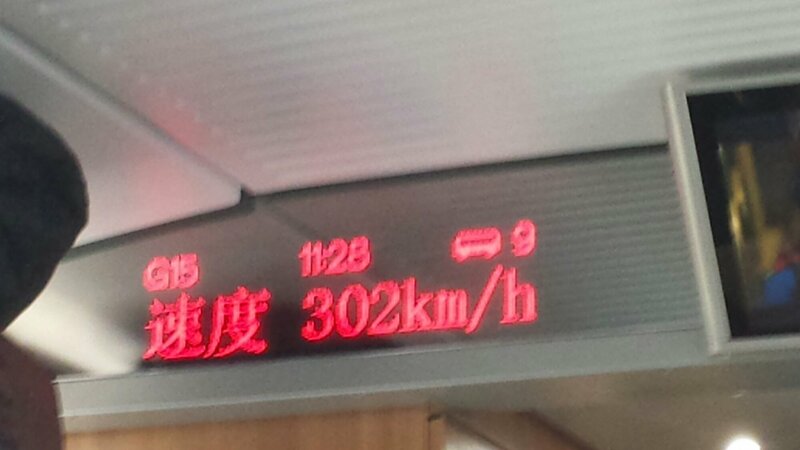 The speed was reduced from 300km/h to somewhere around 160km/h. It was fun watching the scenery change as we headed south. We passed through a hilly area, and ironically as things got green, we passed through a belt of light snow on the ground. 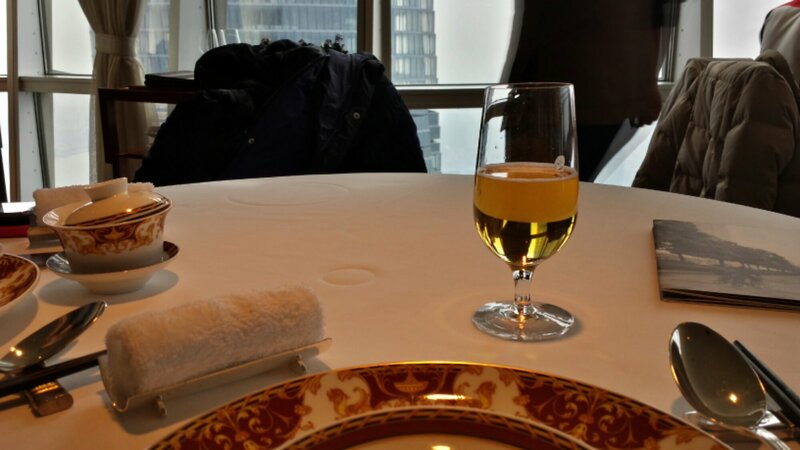 As we continued toward Shanghai, the snow on the ground disappeared and was replaced with rain falling from the sky. We met up with Zhen’s friend in the subway station that’s attached to the Shanghai train station. The subway was really crowded, probably since it was the last day of the spring festival national holiday. Despite the crowded subway, we made our way to our beautiful hotel room at the Puli, and from there to a Thai restaurant for dinner. Although the temple is a tourist attraction, it was quite serene and people stopped frequently to pray at the various alters. We were provided with a bundle of incense when we arrived. We burnt the incense and prayed at a few of the alters while taking in the sights. I wasn’t able to take photos inside the temples, but some of the Buddha statutes were amazing! One of the rooms was so awe inspiring I was moved to tears. After we had enjoyed the temple, both Zhen and I had worked up a serious appetite. It didn’t take much wandering around for us to stumble upon an interesting vegetarian restaurant. Both Zhen and I love our meat, so we were both sceptical about this place, especially since it was so close to a tourist attraction, however, the food was very good! The waitress warned us that we had ordered too much, something we had been doing consistently the whole trip, but we stuck with our order and finished everything. After the delicious lunch, we connected with Zhen’s mom again. This time, she was at work, tasting tea with several of her colleagues. 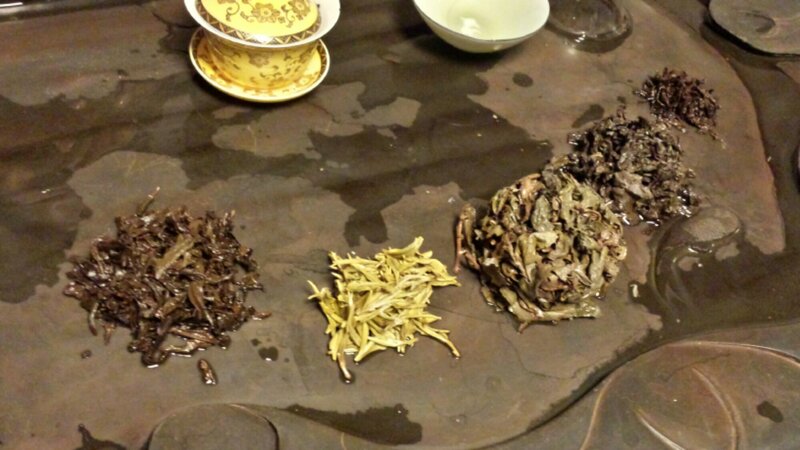 This was a real treat for me, tasting some of the finest tea in China. Wherever Zhen and I visited ‘high end’ tea spots in Canada, she always pointed out the problems with the tea. Even though, in some cases she found it reasonably good (she had advised me that it was actually terrible). After having some tea here, I have to agree with her. 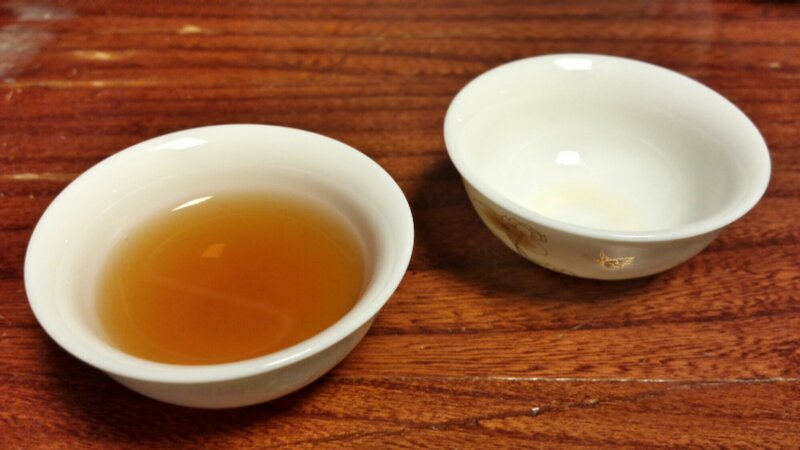 Some of the teas we enjoyed were Tieguanyin poking, Pu’er and Black gouqi (goji) berry. They were all amazing. Finally, we finished the evening dining with Zhen’s mom, her friend and her friend’s husband. Her husband had ordered some liquor so I was encouraged to partake. It was a delicious rice liquor, but I could have sworn it had a Poire Williams flavor. The dishes at this meal were pretty tame, and again, incredibly delicious! 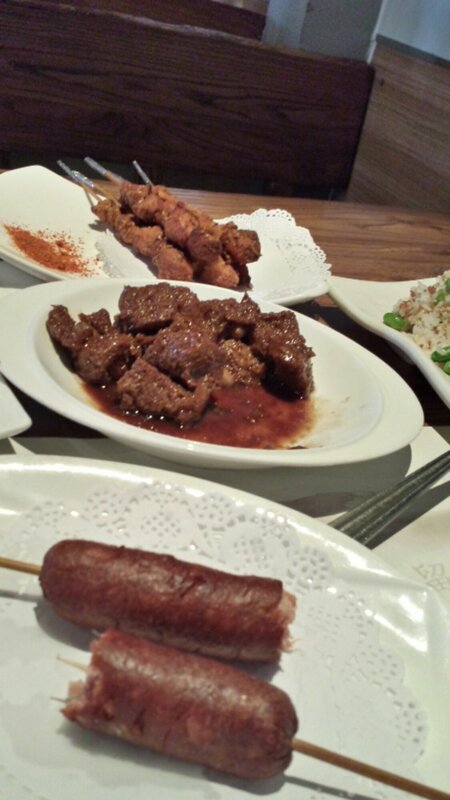 There was duck, pork belly, cauliflower to die for (yes, cauliflower), and even a curry chicken. 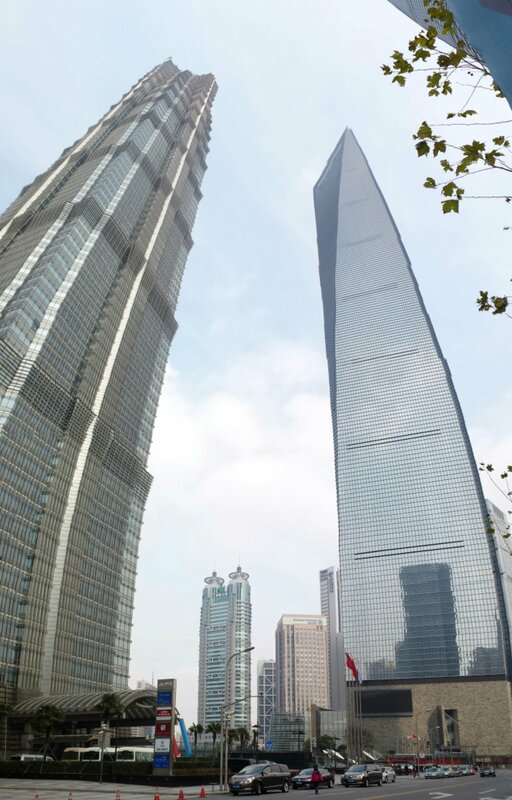 Tomorrow, we are headed to Shanghai bright and early, so I’ll sign out for now. 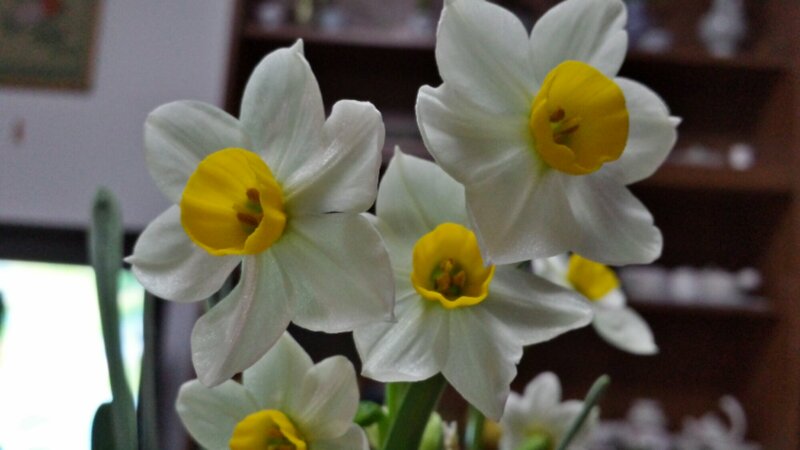 Today is the first day of spring according to the Chinese lunisolar calendar. Fire works and fire crackers can be heard again all around the city, but not just because it’s the first day of spring. Today is also the fifth day of the new year, and today we welcome the god of wealth to ensure a prosperous year. Zhen and I are back at her mom’s place, where we enjoyed another massive, delicious supper! We had a traditional dish which was like a giant spring roll, with a crepe-like wrapper and vegetable filling which was quite similar to spring roll filling. And they were definitely filling! We ended the night with more DiZhu (Chinese card game) and this time I actually won. A single hand…. Zhen won the big money but we didn’t really finish. We had to leave to catch that last bus home and I’m pretty sure I was warming up to a MASSIVE come back! Yesterday we had a relaxing morning and watched some interesting Chinese fantasy show about a crazy emperor and his silver fox / witch wife. I can’t understand a thing, but the Kung Fu and magic spells are pretty awesome to watch, even if all the dialogue is Chinese. I’m using a web site called chineasy.org to learn some mandarin basics, so watching these shows, which always have Chinese subtitles really helps. Once the show was over, we headed to the Xia’an Shopping Mall right next to our hotel and also next to the Olympic site for traditional Beijing style noodles. The place had great food as well as a couple birds and a flourishing coy fish pond. After lunch we met up with Zhen’s mom in a neighborhood with lots of musical instrument stores. I had planned on buying an erhu, but after trying a few, I realized that playing the erhu, a bowed instrument, was going to require a skill set I did not possess and might take years to perfect. So I looked at some Gu Qing and some Gu Zheng and finally settled on a small Gun Zheng. 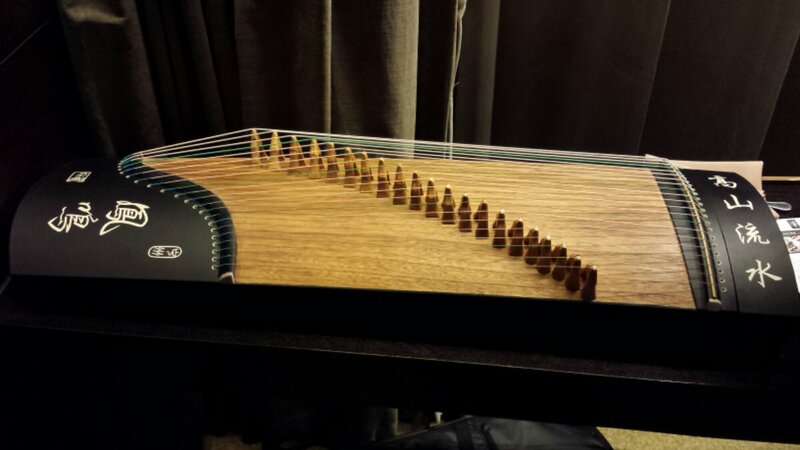 It’s sort of like an auto harp and is easy to make a fairly pleasant sound with, so I think the kids and I will get the most use from it. I would like to add a Gu Qing to my collection of instruments eventually as well. 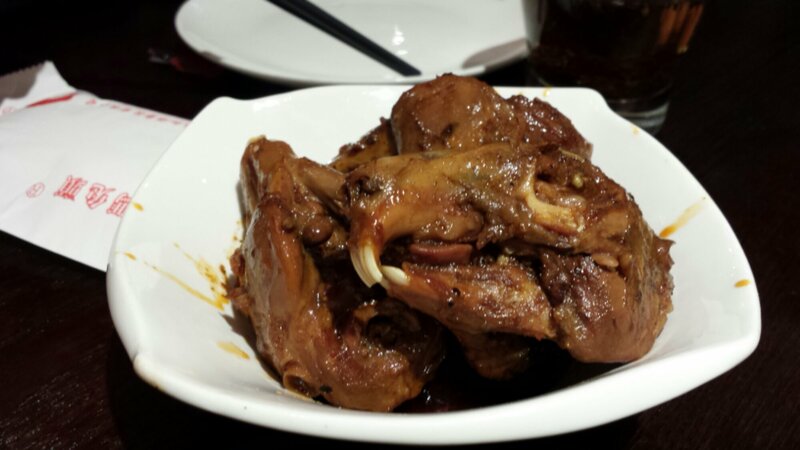 Once we had finished shopping for instruments, we headed to a Siachuan restaurant where I was able to try some delicious rabbit head. Okay. It was pretty tough to get started eating this. But luckily, the restaurant provided instructions. The meal was quite delicious and a little spicy. Sunday we also had a relaxing morning and by the time we hit the streets we were ready for lunch. We tried to eat at a place Zhen really liked but it was closed for Spring Festival. So… We had hot pot again! We had just had hot pot the day before with Zhen’s cousin in central Beijing, so we were hoping to try something different, but the phase we selected was a different style of hotpot, so it wasn’t overly similar. And of course, the food was delicious. While we were looking for a place to eat, we noticed a karaoke place in the plaza, so we headed there after lunch and sang songs to each other all afternoon long. You may think singing karaoke in China is an odd thing to do, but it’s quite a thing here. The karaoke lounges are really big, there are tonnes of them and the song selection is vast. Zhen and I sang to each other all afternoon and headed back to the Olympic village to walk around and take in the sights. Happy New Year … all week long! So New Year, or Spring Festival, is not a simple night of drinking followed by a quiet day of recovery as we know it in the west. It is a week long national holiday with each night having some amount of firework display (provided by locals, not professionals) and a time when familioes congregate around their elders and spend time together. 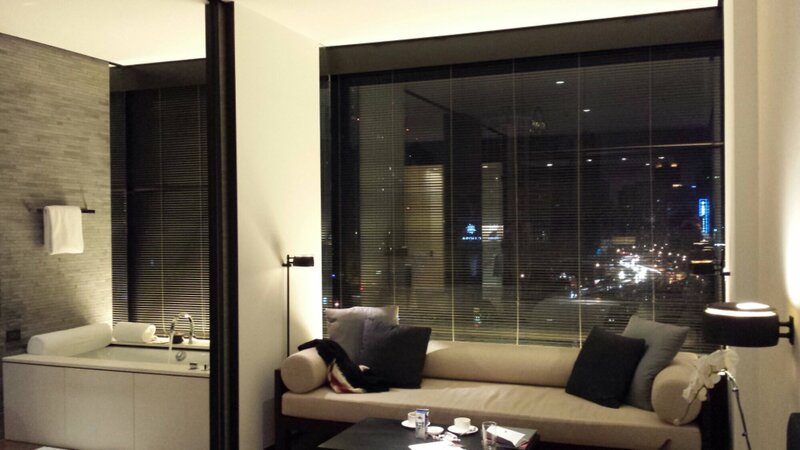 Zhen and I are back in a hotel closer to the center of Beijing. 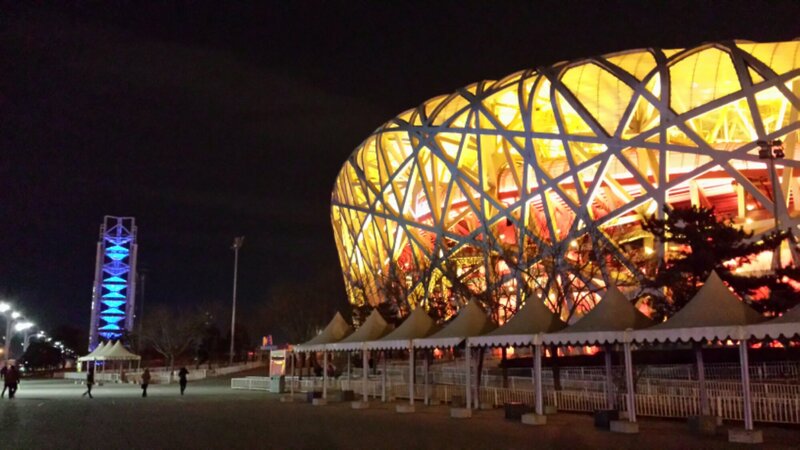 In fact, we are just across the street from the Bird’s Nest, home of many of the 2008 Olympic events. Sadly, we moved out of her mom’s place, where we were for New Years Eve, New Years Day and the following day. We had a wonderful visit there and ate SO MUCH FOOD! New Years day (31 Jan) we went to Ditan as I mentioned in a prior post. I did NOT get lost but I did eat 2 insects! Check that off the things to eat list. They weren’t as disgusting tasting as I expected, but the visual effect was really terrible. I couldn’t look at them after I had eaten one for fear of puking. I had four on my stick but only managed to eat 2. Zhen tried to video the whole thing but we encountered technical difficulties. If I run across another booth of insects, I’ll video myself eating a couple more. Apparently the scorpions are more delicious than the cicadas, which is what I ate. After we finished downtown, we returned to Zhen’s mom’s place. We rode the bus into town and home. It’s only $0.40 per trip! For the last bit of the journey, we used a bicycle (actually tricycle) taxi. I’ve attached a picture of that as well. We bought a pack of cards and played Dizhu (a Chinese card game). Her mom mopped the floor with us and we had a great time! Yesterday (1 Feb), we had a relaxing day at Zhen’s mom place and packed our bags. Her cousin came back out to pick us up and all five of us (myself, Zhen, his wife and Zhen’s mom) headed into Beijing for hotpot. I got lots of pictures of hotpot so I won’t describe it at length here, but it’s a fun way to eat! During that meal I tried some more new things. Eel and pigs kidney were a few. I assure you they aren’t as gross as they sound. 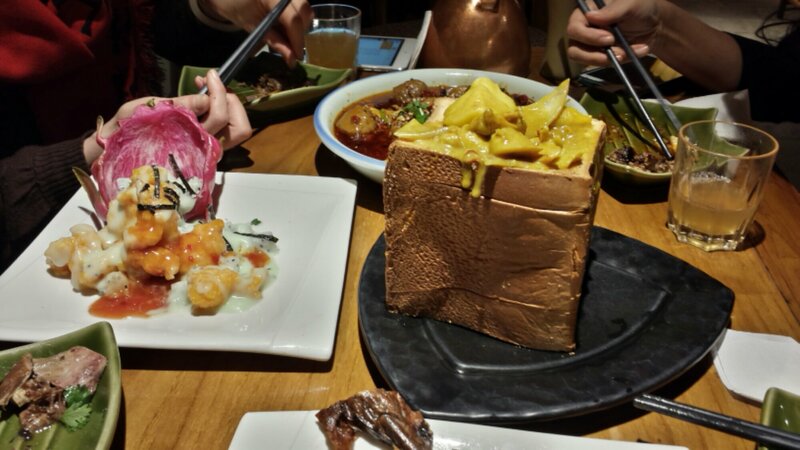 I am finding out that if you don’t want to starve in China, you need to expand your culinary horizons beyond the real of slabs of meat and sides of veggies. In fact, you can throw that concept in the garbage, I haven’t seen a slab of meat with a side of veggies since I got here and I don’t expect I will since we are purposely avoiding western food. After a lengthy but uneventful flight from Ottawa via Toronto, I finally landed in Beijing! This is the furthest from home I have ever been and I am really excited because I am not only visiting the capital of one of the oldest cultures in the world, but I am also lucky enough to have a local to show me around. Lu Zhen met me at the airport and we began our Beijing trip together. I left Ottawa at about 10:00 am on the 26th of January and landed in Beijing around 4:30 pm on the 27th. After I landed and we checked into our hotel, we went for supper near the hotel. 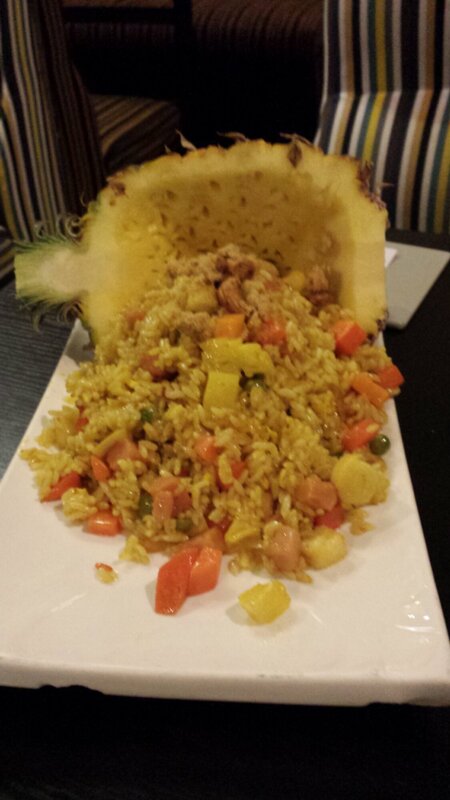 Needless to say, the food was as authentic Chinese as it gets. A strategy I use to deal with jet lag is to never sleep on transcontinental flights. So when the time finally came, I slept like a baby. 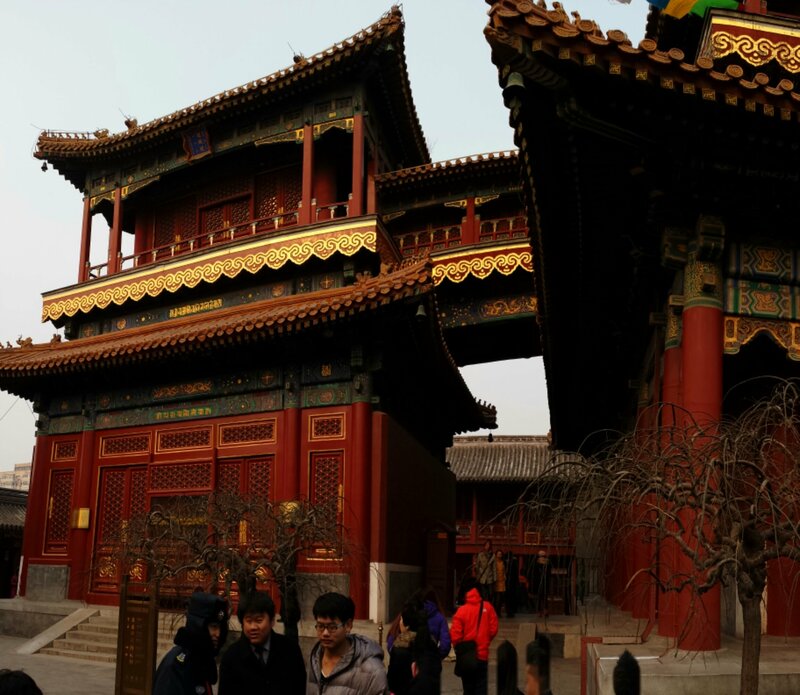 Then next day, we went to the forbidden city. 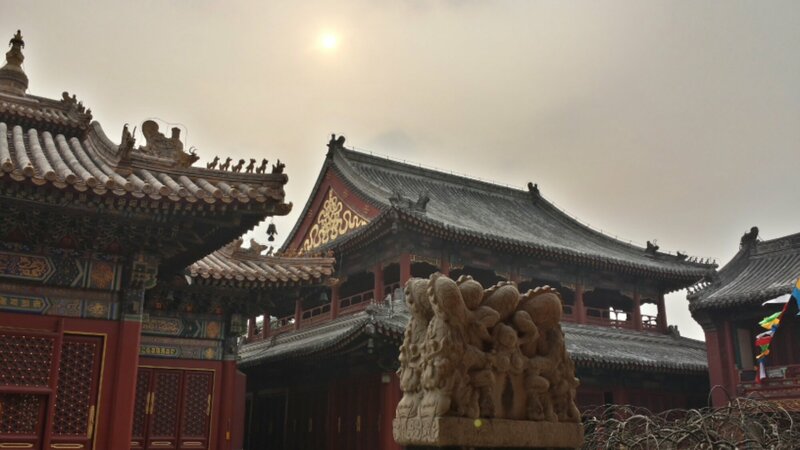 The Forbidden City was the Palace of the old emperors. We each rented audio guides, which detect your location in the palace and recount interesting facts about the all the various temples and court yards. 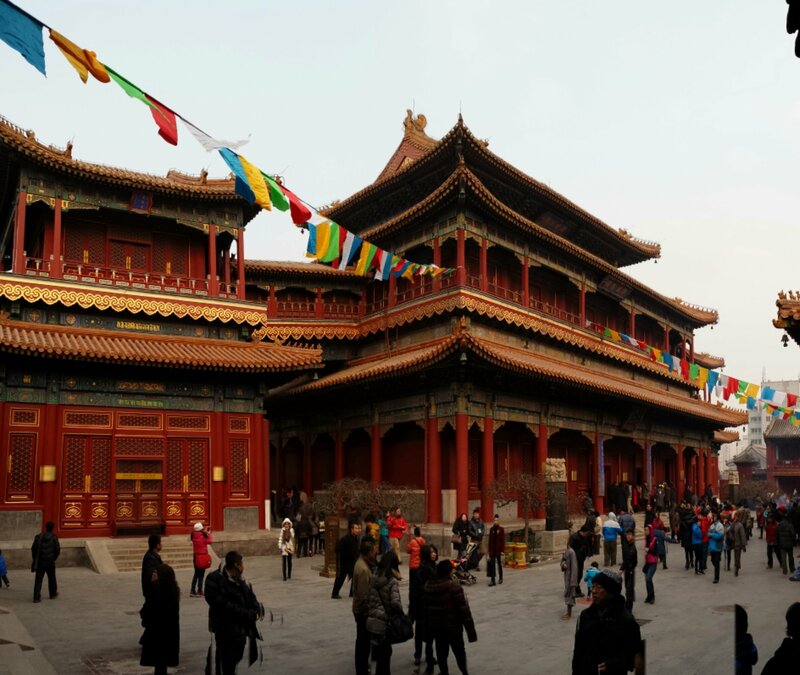 After the palace, we toured an interesting district called Nanluoguxiang. This area featured lots of old shops in traditional one story houses. Effectively, it was the opposite of the palace, a place where commoners used to live, eat, drink, buy and sell. I saw some fans and parasols which would interest the girls, but they were a bit overpriced since we were in a tourist district and it was only my second day, so I didn’t make any purchases. Finally, we returned to the hotel to freshen up and ended the evening with a lovely supper with Zhen’s mom, their family friend. We had some amazing Roast Duck and a bunch of other stuff.